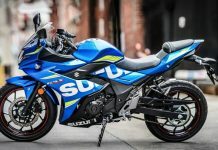 A couple of weeks ago, Suzuki Motorcycles India announced two new dual-tone paint option for the Suzuki Gixxer 155 – Metallic Triton Blue with Pearl Mirage White (BAQ) and Candy Antares Red with Glass Sparkle Black (APS). 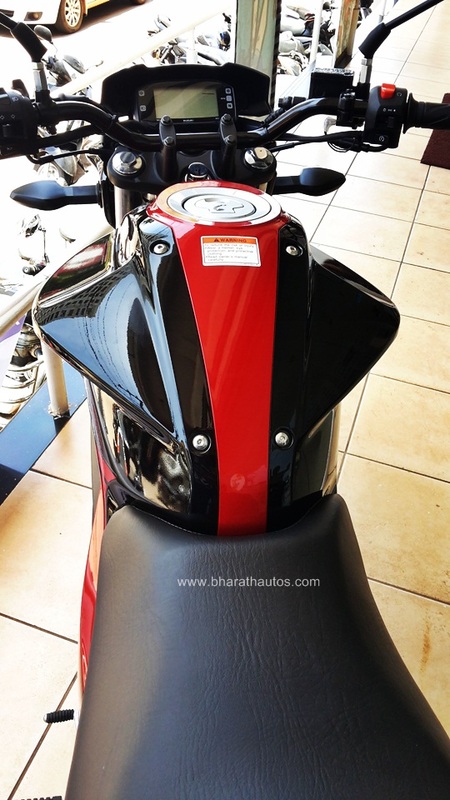 We were the first to report about the dual-tone Gixxer, now it’s official and has already reached few dealerships across India. 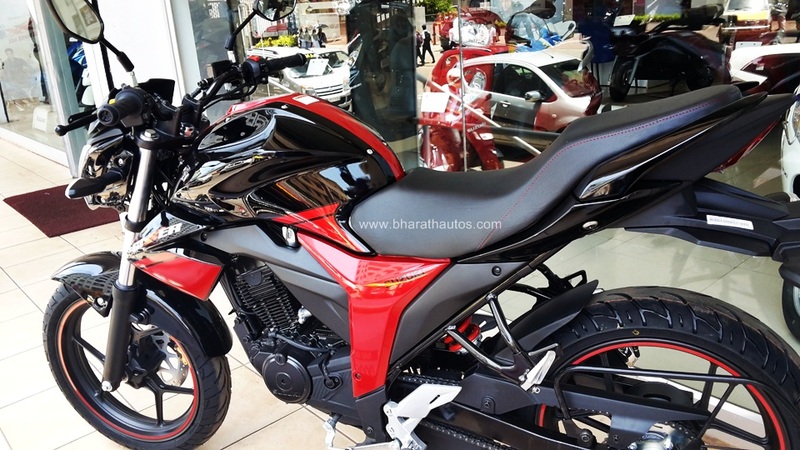 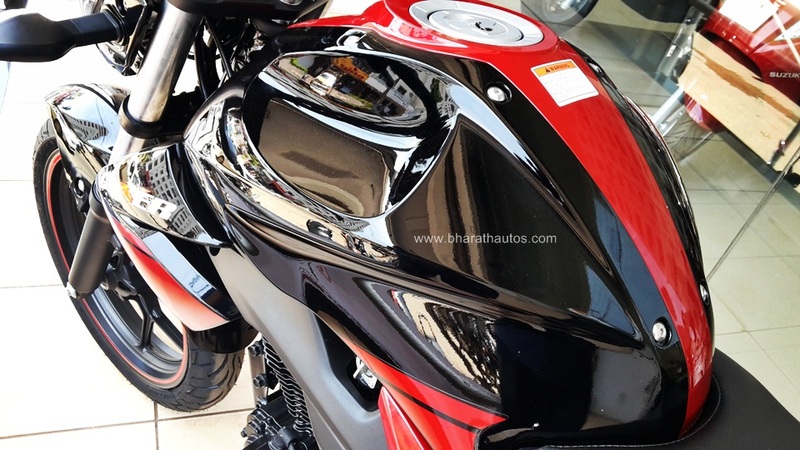 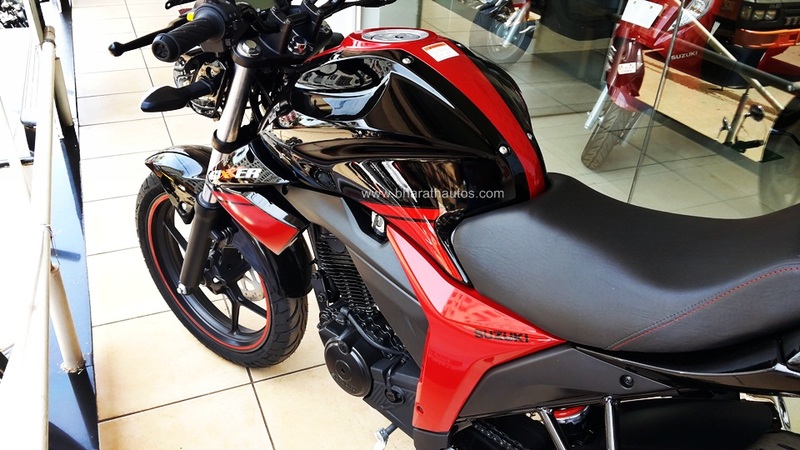 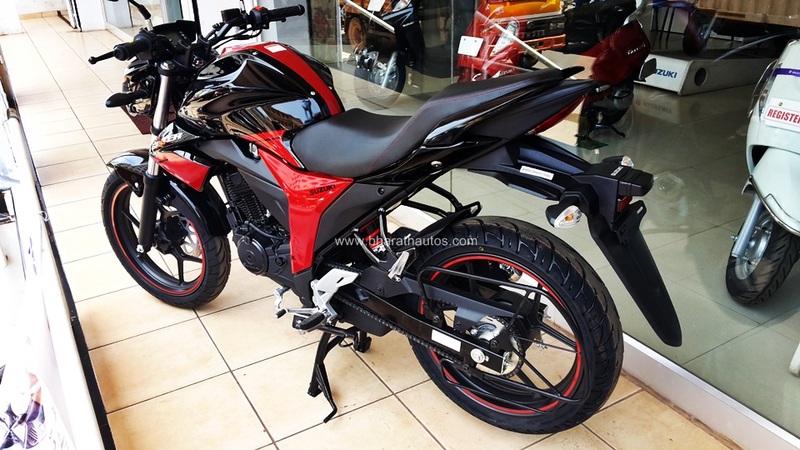 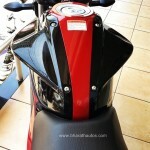 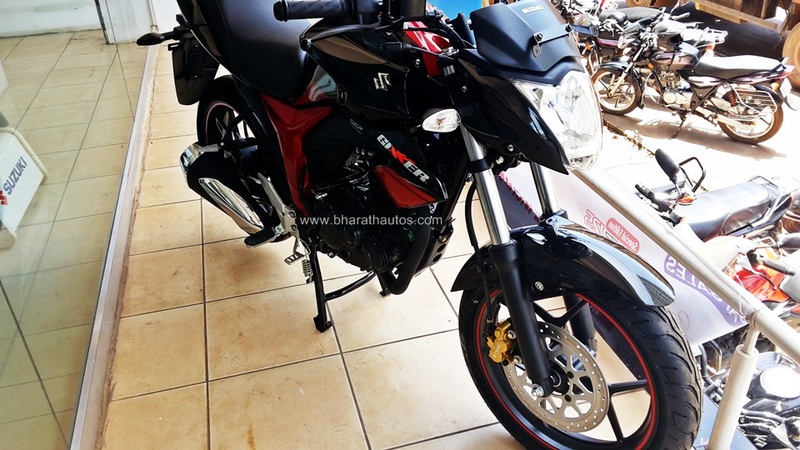 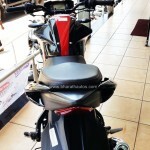 I got an opportunity to snap the dual-tone Gixxer in Candy Antares Red with Glass Sparkle Black (APS), however, another paint scheme Metallic Triton Blue with Pearl Mirage White (BAQ) was not available at the dealer, might be available at a later stage. 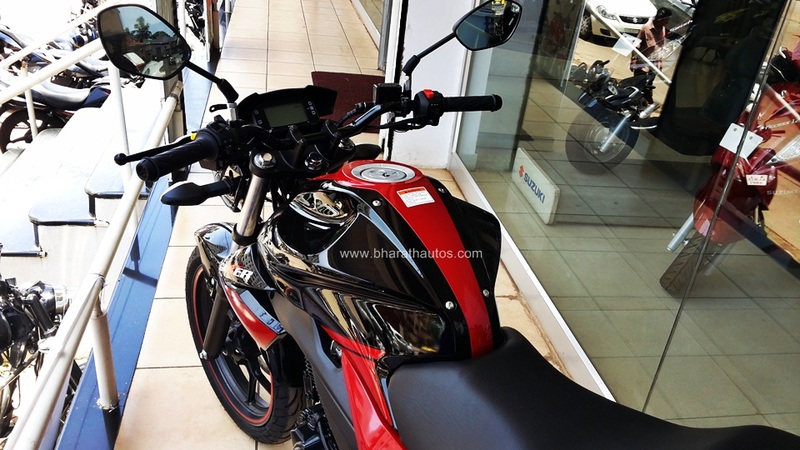 Apart from the dual-tone paint scheme, it gets a new sporty body graphics, new clear lens turn signals and the racing strips on both the rims. 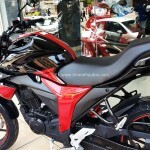 It also gets a new key mascot, sporting the iconic Suzuki ‘S’ of the flagship model. 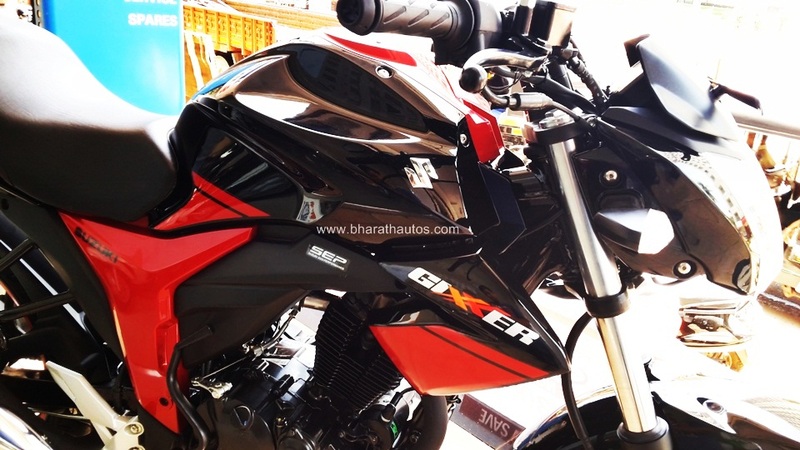 Features like the digital instrument cluster which displays speed, fuel level, engine temperature, engine rpm, trip, and gear position is similar to the regular Gixxer. 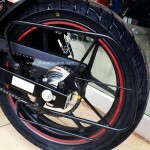 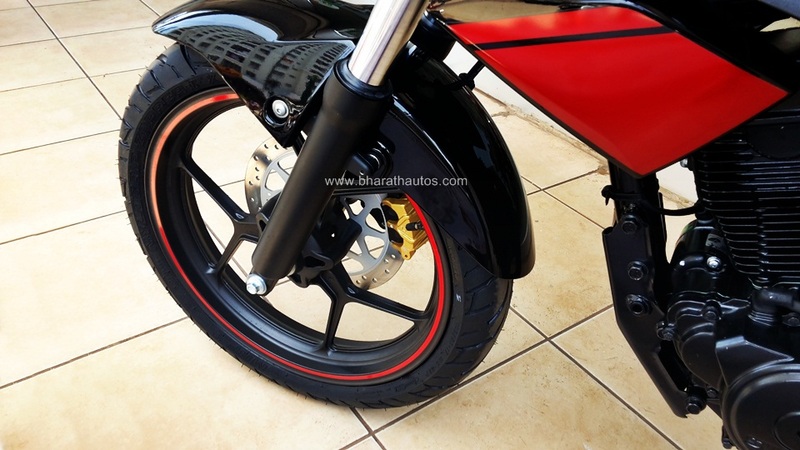 The changes are purely cosmetic and there are no amendments to the mechanical bits. 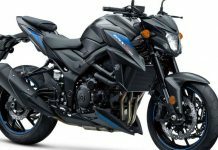 It comes powered by the same 4-stroke, single cylinder, air-cooled, SOHC, 2 Valve engine producing maximum power of 14.8 PS @ 8000 rpm and peak torque of 14 Nm @ 6000 rpm. 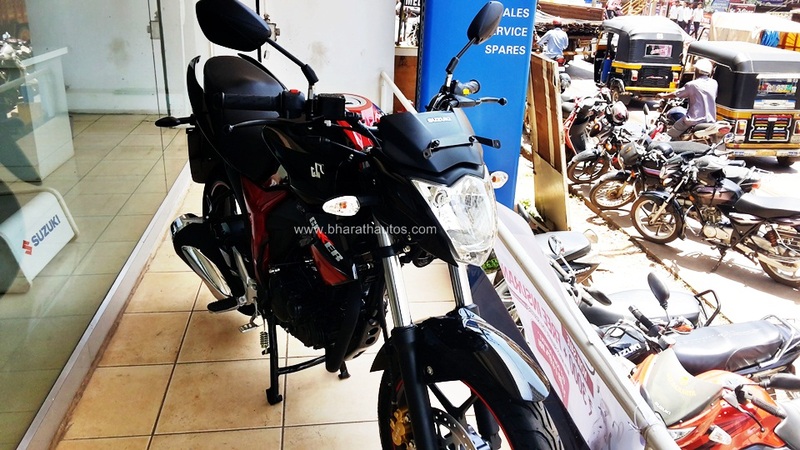 Featuring Carburetor fuel system, this unit is mated to a 5-speed gearbox. 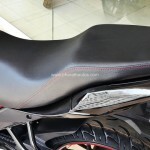 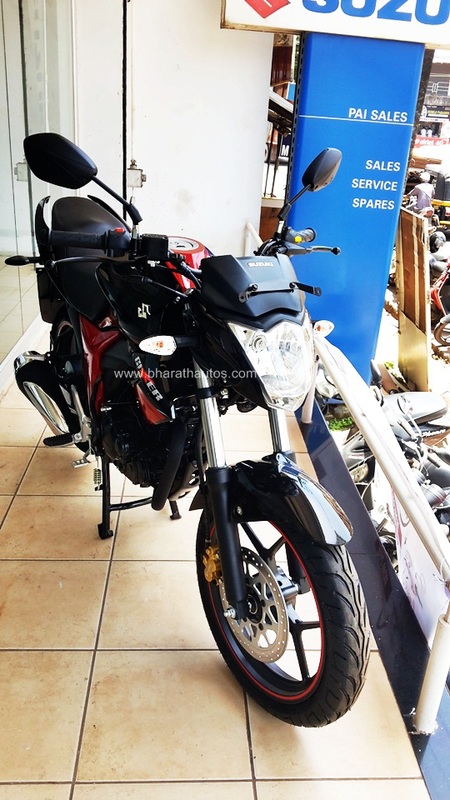 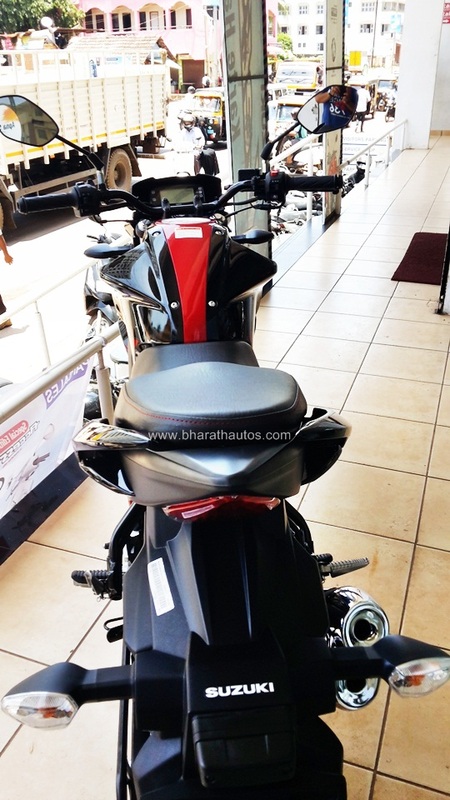 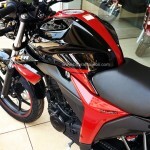 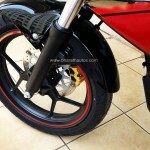 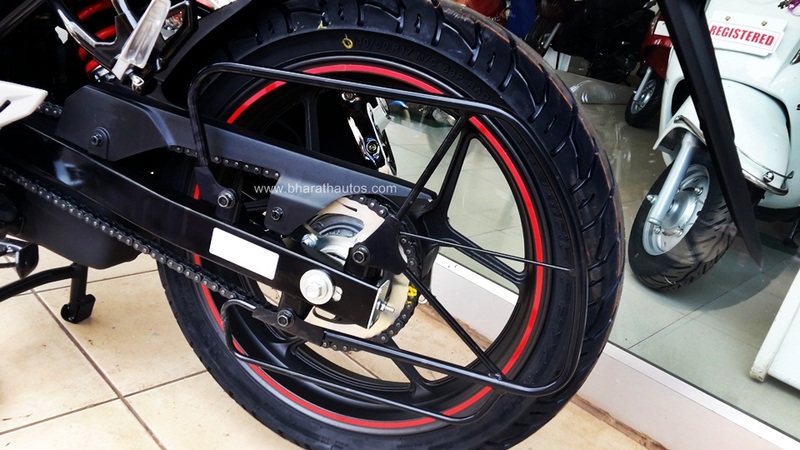 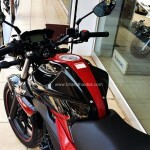 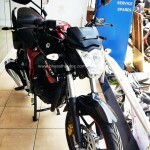 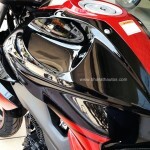 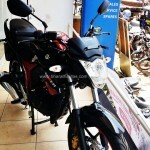 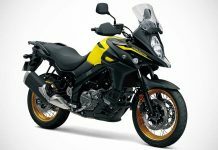 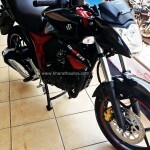 It delivers an ARAI certified mileage of 63.5 kmpl and has a top speed of 120 kmph. 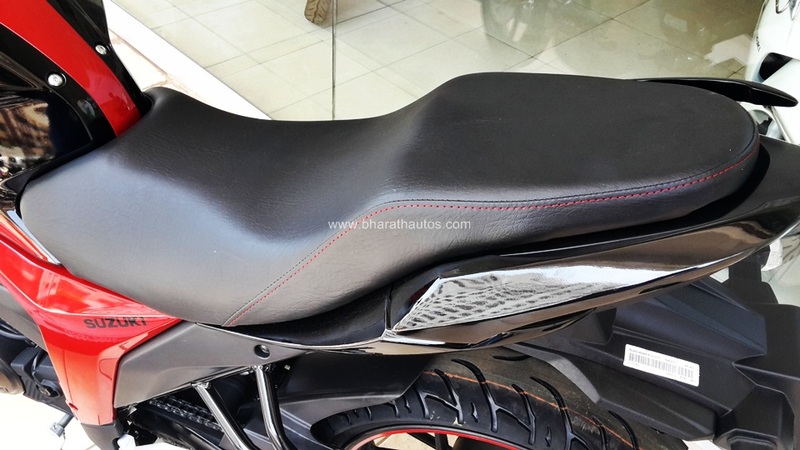 As far as pricing is concerned, the dual-tone Gixxer costs Rs 85,729/- while the regular single-tone Gixxer costs Rs 84,634/-, that’s approximately Rs 1,000/- costlier (both prices are on-road New Delhi).